Andrew Bean is Chaosium's convention coordinator for Australia, New Zealand, and Asia/Pacific. 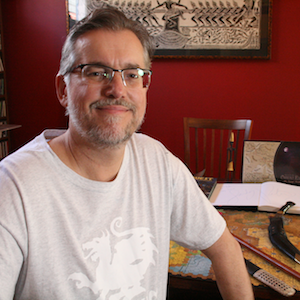 Andrew first encountered RuneQuest as a 16 year old and it changed his role-playing life. Playing Chaosium RPGs almost exclusively from that point forwards, with some of the luminaries of the Australian RPG writing scene, then led on to Andrew serving as Australian distributor for Tales of the Reaching Moon magazine and later the RuneQuest Gesellschaft aka Chaos Society’s zines and publications. During the first "RuneQuest Renaissance" Andrew attended many of the RQ/Glorantha Cons around the world, as well as earning his spurs as an organiser for RQ Con Down Under 2 (Melbourne, 1998). This involvement has allowed him to meet, befriend and play with many of the Chaosium tribe around the world. Inspired by watching Dr No and the Indiana Jones movies at a young age, Andrew tries hard to be an International Man of Mystery. This pursuit has involved visiting every location in these movies with wife and daughters in tow, getting a PhD, and then helping set up a university in Vietnam. Next, Andrew spent more than a decade roaming the Arabian wastes in search of lost cities, ancient ruins, and rare Arabian Leopards and Oryx, before returning to Melbourne, Australia in 2013. He now looks forward to using his International Man of Mystery skills in service to Chaosium. When we finally hold a convention in the cyclopean ruins of Nan Madol, Phonpei, his work will be complete.